Only 1 month left until the end of the financial year! Are you ready? Any readers that happened to be reading my blog around this time last year would know how excited I get around tax time. Before you ask....I can assure you that a) Yes...I have a life and b) No...I am not nuts. When I studied finance at university one of the first things that was taught to use was that markets were efficient and that there was no way to beat them. This was proven out by studies and seemed to prove up the 'Efficient Market Hypothesis' (EMH), the idea that when relevant information hits the market it is immediately is priced into the market. The upshot of that particular hypothesis for investors is that you cannot consistently outperform the market. You can have 'lucky runs' but the market is constantly pricing in new information and if you have a different view the the market, it is because you do not have as much information as the market. The EMH has constantly concerned me as an investor. After all if you can't beat the market what is the point of researching stocks in order to achieve 'alpha'? This has also affected my professional career. Although, as I have said before, I find value investing the most appealing form of investment and the most 'rational', I have always wondered about this innate inability to know more than the market and to thus outperform the market in the long run. Those of us who have been investing in the recent past have seen greed and fear at it's most rampant. The GFC and fear of all things debt related and the more recent greed associated with any yield providing stocks have caused share prices and market valuations to skew wildly away from what value or fundamental investments would suggest. I was browsing a news website recently and noticed an article which went through the basics of maximising your superannuation for when you retire and the first point the author wrote was to remember that superannuation was not an investment class - it is actually just a tax effective vehicle. I agreed with the point so didn't spend much time on it. When I came to the comments section below though I noticed that there were a fair few readers who posted comments disagreeing with this notion as they had most of their retirement funds invested in superannuation. This post will go through why superannuation is NOT actually an investment class and why the author of the article was quite right in describing it as an investment vehicle. The biggest misunderstanding comes about because, like me, many people use superannuation as a set and forget type investment. Most often they are invested in the 'core' or 'balanced' strategy at their fund and the superannuation provider invests their money for them and if they check their superannuation at all it is to make sure that the employer is contributing their funds and to (occasionally) check the balance. They therefore view superannuation as an investment which whose value they are contributing towards and the valuation of which fluctuates like a normal investment class. However this is the wrong way of thinking about superannuation. Superannuation is actually just a tax effective vehicle set up by the government to encourage (and force) people to save for their retirement. You don't actually invest in the superannuation. You invest in underlying assets such as shares, property, fixed interest, infrastructure and other alternatives through a superannuation vehicle. Superannuation is much like a managed fund (which is also a vehicle). Most people understand that they are not actually investing in a managed fund. Rather they are giving their money to a fund manager to invest in shares or property or whatever other strategy their fund may have. Superannuation is much the same. You are giving your money to a superannuation fund to invest in the same asset classes that you could otherwise invest in outside of your superannuation. It is easier to think of superannuation as a vehicle if you remember how self managed super funds work. This is where you manage your super yourself and invest your superannuation money in whatever you want to invest in (rather than how the superannuation fund invests your money). It is easy to see in this case how the actual investment classes are the shares, property, alternatives etc. that you invest in rather than the vehicle that you set up yourself. People who think about superannuation as an investment ignore the fact that they should be actively thinking about what their superannuation fund invests in. Although I do not advocate doing it too often, you should really think about what sector allocations you have within your superannuation fund and switch it to suit your own risk profile and views. That is, a person early in their career should not have the same superannuation choice as one who is nearing retirement. If you think of superannuation as a blanket investment you are possibly going to ignore the fact that you should be thinking about what and where your money is invested. How do you think about your superannuation and do you view it as a separate investment class or just as one way in which you invest? How much superannuation will I need when I retire? This will just be a quick post from me today to share with you one of the most inspirational speeches on entrepreneurship that I have ever heard. I confess that I had not heard of the speaker (Wycliffe Grousbeck, CEO and co-owner of the Boston Celtic) before but rather just stumbled across this video while browsing on YouTube. Before I share my views on the video and what I took from it I recommend that you watch it. Note that it is quite long however you can listen to it while doing other tasks (i.e. it does not require you to actually watch the screen). The Business Review Weekly released it's 2013 rich 200 list today which ranks, profiles and tracks the wealth of Australia's richest 200 people and families. I confess that I have been fascinated by this list for years and it is the one edition of the BRW that I read without fail every single year. Below is the top 10 list of the richest Australians for 2013 (Source: BRW) - their combined wealth of $66.4 billion is staggering. Be careful about what you post in investment forums: lawsuits bite! Most of us who are interested in finance and investing find ourselves in discussions about investing with our friends family and colleagues. Naturally part of this discussion centres around venting when things do not go our way or when we feel we have been cheated or when corporate executives or directors of companies we have invested in undertake actions that we feel are not in our best interests. Given the important of the internet in modern communications, more and more of these communications are happening online through investment forums (such as HotCopper) or through people expressing views on their own blogs (such as I do on this one) or by commenting on other people's blogs. As readers of this blog would know I have frequently criticised companies - both listed (such as FKP over their rights issue) and small er companies(though less so the small companies - only when I think they are real scams). When you post something on the internet it never goes away - we all know that. It's the reason we are all so careful about our Facebook and other privacy settings. However we seem to forget this when we are on investment forums talking to other 'hard done by' investors. What you always need to keep in mind, however, is that you can be sued for these comments. This post will cover my firm idea that people should only invest in products and investments which they understand themselves and should not 'trust' others to do hat is in their own best interest. It is controversial because it suggests that you and I as investors and savers should not be giving over responsibility for our financial well being to others (i.e. those in the investment community). Should I try internet dating? What is out there and should I pay the high membership fees? This weekend warrior post will deal with internet dating. Once I emerged from hibernation after my recent break up and decided to get back on the bandwagon I thought I would expand my dating pool somewhat and so decided to look at internet dating. Note, as with most of my posts, this will be from an Australian perspective. Why did I try internet dating? The social taboo is largely gone from internet dating. I think I was one of the few dinosaurs left who thought there was still a social taboo attached with internet dating. I took a poll of almost every guy and girl I met (in my age group) over a period of about a month. I asked friends, family, strangers on the street, waitresses in restaurants and everyone knew someone that had found their partner doing internet dating. Taboo broken! What sites are there out there? How will the Australian 2013 - 2014 Federal Budget affect you? I confess that although I am not particularly drawn to any political party, I have found the Gillard Government's fiscal policies to be frustrating and spineless. This is probably a function of the hung parliament they have had to negotiate but it was nonetheless very frustrating. From my point of view this budget surprised me - it was pragmatic, invests in Australia's future and does not do the pork barrelling and vote grabbing that most election year budgets do. We are all going to be a little worse off but I do appreciate having a government that is willing to acknowledge that we are in a worse economic position now than we were a year ago and that does not spend just to grab votes. So how will the 2013 - 2014 Australian Federal Budget affect you? Like all things...it depends. There isn't really something for everyone in this budget. From an individual point of view there are not a great deal of positives and some negatives but it really has to do with how much you are already getting from the government (or not getting). The rest of the benefits do not really impact individuals at all - they are all about nation building. It is about infrastructure (roads, rail) and other measures that only a government can fund. If you're going to try and improve a country and an economy in the long run this is are the types of things that need to be funded. Personally I got no real benefits from this budget but I'm just glad that we finally have a government that is thinking about the long term. Am I confident of hitting my $90 million net worth goal? Yesterday on twitter, one of the readers of this blog asked me whether I was confident of achieving my $90 million net worth target even though I was at the early stages of my journey. I was going to send a quick response with something along the lines of 'of course...but small steps just yet' but then I really started to think about the question. I started off with the number I'd be willing to retire with today and never work again (as I'm in my mid 20s it has to be pretty high) and I settled on $50 million. I also set a super aggressive target to achieve this in 20 years - inflation adjusted (3% p.a.) that comes to $90m which is my target. Other than some sloppy grammar, I now realise that the one big thing that was missing in this goal was the how. That is how do I get to a $90 million net worth and this is the question that had me stumped when thinking of a reply on twitter. I won't outline it here but if you look at my expenditure tracker you can see what my take home wage is today. Obviously there are many simplifying assumptions in there (the most aggressive one being my ability to save 50% of my take home wage) and this does not take into account big life expenses such as having children, getting married and all those other things we hope we will do in our lives. However I do not think I am being overly aggressive in my calculations. If anyone would like me to upload the spreadsheet or send it through to them post a comment and I'll set up a basic spreadsheet so you can do it for yourself. Followers who read this blog on a regular basis know know that my approach to investments is fairly conservative and unimaginative. I have typically spurned investment classes such as art, gold and have even written a post before on a mail order coin scheme which I considered to be a scam. Therefore it may come as a bit of a surprise to some to hear that I have bought my first collectible coin set. I have been looking into this area for a while and have probably over-researched it compared to how much capital I am actually going to allocate to this strategy. I have set out my investment criteria and what I am seeking to do below. Why have I diversified into collectibles? If you can't enjoy collecting a product you have to question whether it is right for you. For example I would find it quite hard to become a serious art collector because I do not like it enough. What does 'generating alpha' mean? If you have started to look into investing and have bought a few investment books or (more than likely) surfed the web to work out how to make money investing in the share market you will almost certainly have come across the term "alpha" and seen the investment communities obsession with generating it. So what is alpha and how and why do investment professionals try and generate it? As you may have read in my post before on risk - generally speaking, when you seek higher returns you must accept a higher level of risk. In order to achieve a higher return than the market you need to have a portfolio that has a higher beta (volatility or risk factor) than the market. However alpha is different - if you generate alpha you are generating higher returns which are uncorrelated with market returns. It is an abnormal rate of return above what would be expected from an equilibrium model like the capital asset pricing model (CAPM). Why do investment professionals (and others) focus on alpha? People focus on alpha because it is, if you can achieve it, a way of achieving excess returns for the same level of risk. As I mentioned in a recent post, I decided to move out of home recently and am renting from a friend who recently purchased his own place in an area that I wanted to live. I am getting the room incredibly cheap and it includes all utilities and internet. However after paying my rent a month in advance, I then had to buy furniture. I just had to buy furniture for my room so I did not think it would cost that much money. I went online to check out all those furniture stores that advertise on TV all the time and was amazed at how much furniture actually costs. I wanted decent quality stuff but was definitely not happy paying the prices that they were asking for so I decided to try and get everything that I wanted, including the quality that I wanted, for a reasonably cheap price. Here is what I did and how you can also save money when furnishing a new house or room. You do not need to buy absolutely everything you need at the start. For me I really only needed a bed at the start and everything else I could stagger over a few months. I did make a list of everything I needed though in case the opportunity arose to buy them for a decent price. The room I was moving into did not have air conditioning and I really can't handle particularly hot days. I was going to go buy a pedestal fan from the local store however found a really old, dusty and grimy one lying in my dad's shed that he said he was never going to use and that I should just throw out. A bit of elbow grease, some mineral terps and an hour later I had saved some money as well as having the satisfaction of having saved the environment from one more piece of unused electronic equipment. Now there is no way known that I would buy something like a bed or a mattress from a charity store however I have been hunting for a leather waste paper basket for my room. It doesn't take me long - every time I pass one I pop inside to see what they have. I have not yet found one that I like but you have the dual advantages of donating to charity and getting what you want for cheap. This can also apply to bedside tables and other small furniture items. I could not believe how much beds and mattresses cost from regular stores. The prices were truly staggering. I had almost resigned myself to buying one of those overpriced pieces of furniture (my mattress is NOT something that I would ever compromise on - I'm just too fussy) when someone referred me to this great online store - Tommy Swiss. April was an interesting month for me in terms of my expenditure tracker. Although it wasn't spread evenly, I saved almost exactly how much I wanted to this month and my personal expenditure overspend was the lowest it has been since I started tracking it over a year ago. Overall this was a pleasing outcome however on a cumulative basis, March 2013 is really still hurting me. As a result a lot of expenditures for this month went on my credit card. This had the effect of pushing out some big expenditures into next month's credit card bill (which has already blown my May 2013 personal expenditure target). As you can see my expenditure tracker is still the big negative drag and this was largely because of March 2013. Interestingly if you compare to where I was at in April 2012, it is a rather similar position. I am going to continue to work on my current expenditure and savings goals instead of resetting them because I think they are achievable. I'm still going to blow my personal expenditure forecasts for next month although I am looking at ways of tracking my expenditure more in real time so I am not constantly lamenting it at months end like I have been in these posts. 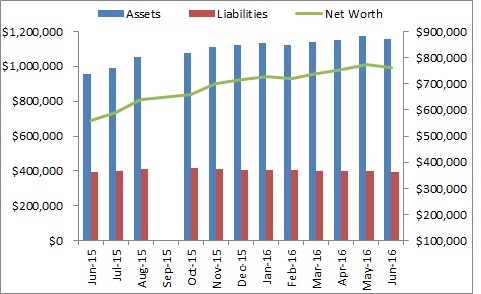 In my March 2013 net worth I forecast that April would be a much better net worth result than March had been due to lower credit card repayments and a greater ability to save and invest money this month. My performance was so much better than I expected mainly due to the continued strong run in the share market. I was particularly happy with how this month turned out and I have outlined some of the reasons for it below. As you can see this was mainly an asset driven performance outcome. I bought some broad based index funds over the month. I was actually planning on spreading my purchases from week to week but the first purchase ran so strongly that I thought the market would correct and held off from putting in more which turned out to be an error. I have some externally managed funds outside of my exchange traded funds. I only check the value of these whenever a statement is sent out to me (once every six months). I do not add to these at all because the expense ratios are too high so I do not keep a close track of them. I am also going on a weekend trip away and had to pay for my accommodation on my credit card. In my April 2013 expenditure tracker I will outline in more detail the interplay between my cash and credit card balance. I'm currently trying to find a more dynamic way of keeping track of my expenses. This is becoming more relevant as I have to do my own shopping since moving out of home (as well as socialising a lot more). The share market is the big swing factor in how I have been performing. Indeed I thought this month was going to be a close to negative performance again because of the share market dip at the start of the month. Assuming the share market remains flat I do not think May 2013 will be that good in terms of my net worth performance. I have a reasonably big credit card payment coming and will be going away on my holiday which will soak up some cash as well. I am targeting a net worth of $370,000 for May 2013. May 2013 Sector Allocations: An opportunity in resources?